Finally, fish tacos! Or fish taco salad I guess, I just make tacos on lettuce and these turned out kind of messy; so we ended up eating them with a fork. 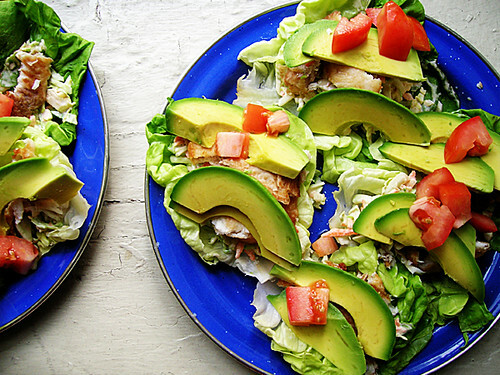 To me, fish tacos are: fried fish, slaw, avocado, and tomato. On lettuce, but obviously you can put them on corn tortillas if you want. For the slaw, brussels sprouts are my go-to tiny cabbages, or possibly belgian endive would be nice too. Separate the leaves from the head of lettuce, rinse, spin dry, and divide between two plates. We are making fish tacos for two. Trim, halve, core—by core, I mean trim out the little stem of the sprout— and thinly slice the brussels sprouts. Peel and grate the carrot, and toss in a bowl with the sprouts. Whisk together about three spoonfuls of mayonnaise with enough lime juice to thin it a bit, pour the mayonnaise over the slaw, and toss together. Dredge the tilapia in flour. Heat a good layer of oil in a skillet until it's shimmering, then lay the tilapia in the pan and fry for a couple minutes on both sides. Remove and drain on a couple layers of paper towel, then roughly chop into pieces. Finally peel, pit, and slice the avocado and dice the tomato. Layer a spoonful of slaw on each lettuce leaf, then fish, avocado, and tomato, and finish with a sprinkle of kosher salt and a couple grinds of black pepper.